Life would be so much easier if I could learn how to jump through hoops. Not doing has been a character flaw I’ve had since birth. Teacher’s told me to question everything and then became irate when I asked why? Where others backed their books, did the assignments and prepared for lessons, I was the kid doing his homework in the playground, a few scribbled lines instead of a page. Term marks were one of those hoops I didn’t understand. The school said I was intelligent and had to work hard so that I could go to University. I had other ideas. I wanted to work and had no intention of staying in school for any longer than I needed to, far too many rules. Even when I started working, the first thing I was told was “You’re really bright. It would be a waste not sending you to college, maybe even university.” What was wrong with these people? Once, I even tried to do what they asked and went back to school. I’m big, loud and noticeable. When I’m bored, I become even more noticeable. When I’m in a room with a halfwit, who doesn’t know the subject they’re teaching, I’m obnoxious. Probably the main reason I started to write is I love to entertain. Of course I’d like to get rich from it, but I need to enthral and make people laugh. I can be a show-off, always craving an audience. I wrote, wrote and wrote again until I believed I had something worth showing to the world. The time had come to publish. After a few queries I found the route to the audience was barred by publishers and agents. No problem, I’ve got a good product (I thought.) After a few rejections, I started to research more about what these people wanted. I knew it had to be modern (tick,) well written (tick), grammatically correct (tick), targeted at the agent’s market (tick). To the best of my knowledge I’d never break a law, but I don’t get along too well with rules. Mathematics is governed by laws, such as, BODMAS. Publishing appears to be governed by rules. When the runaway successes of recent years ignore them, there’s little incentive to join the game. For me, when a story is done. It’s done. I’m not going to revisit it to rework the style, remove or add characters because somebody else feels it might help. I need to file the job away and move on. This is why I decided to self-publish; I’d rather have a smaller audience now, than keep waiting for the gate-keepers to give me a chance to play on the big stage. What’s it cost so far? I don’t count the cost of the writing course. That was about three hundred pounds and proved the best money I’ve ever spent. I loved it and when it finished, I seriously considered going back to do it again. I needed an editor to work through the story with me, a cover and ISBN’s. So far, that totals six hundred and twenty-five pounds. As leisure activities go, I think this is acceptable. The biggest cost by far, is time. That’s a commodity I don’t have enough of. Writing time is my most precious. I try to guard that, but often find I can only manage twenty- thirty minutes a day. Oh, the delight of a client at the end of the train line, rather than up the M6. The editing, I originally thought was boring, but now appreciate as part of the creative process. Michael Angelo didn’t hack David out of a block of stone with a single massive chisel. He used increasingly finer, more delicate tools. I swap from screen, to paper, to Kindle as I progress, going around the loop about three times. Preparing the documents for publication has been fairly trivial. The Kindle format took a couple of days. Createspace will be easier next time, taking about five days. One of my biggest glitches was that I’d not included the first three pages, copyright, title etc. They took hours to get right. By far, the most begrudged cost is the time spent marketing. I know I should love it. Whilst I’ve already hinted I’m an extrovert. Seeking an audience has always been on my terms. Marketing is staying active, regardless of how I’m feeling. Carved from ice with blades of fire, the rigidly feminist state of Serenia breeds heroes. Unimaginably perfect, Amara the Magnificent, the legendary Ultimate Warrior is their greatest. Five years since Amara’s mysterious disappearance, her daughter, Maryan, struggles to escape her mother’s formidable shadow. Shunned by most, her only friends are oddball characters from the edge of society. The Queen sees Maryan as an asset to the nation, a pawn to play with and a pretty bauble to appease the neighbouring king, but lurking beneath the surface, an ancient terror plots to wipe out Maryan’s bloodline. 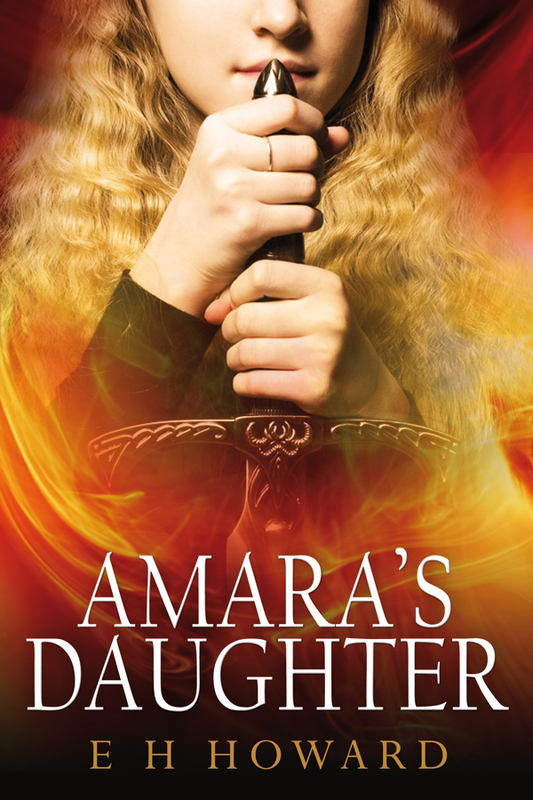 Friend, lover, and more, Amara’s Daughter is a turbulent, rite of passage story tracing Maryan’s growth from naive schoolgirl to the woman destiny needs her to be. On the arena floor, Asti dropped her full weight through her knee on Barag’s windpipe. A short stab wedged her tiny scissors deep into the man’s left eye. She stood up and pounded them into his brain with her heel. In the silence that followed, she pointed at the Queen. “If you won’t honour our traditions, maybe it’s time for us to change the leader of our nation.” Keeping her back rigidly straight, she marched purposefully across to the shadow of the tunnel. Nobody moved and nobody cheered. The body of the fallen man twitched in a growing pool of blood. Living in Cheshire with my wife and our two dogs (Milly and Molly,) I’ve run a successful computer consultancy for many years. The business continues to thrive and I feel blessed that people pay me to solve complex problems for them. One day, we hope to spend a portion of our year on the Greek islands, where I would love to spend most days writing, but for now, I’m content that with three adult children, I’m being presented with grandchildren at a fabulous rate. I split my writing time between short stories and novels. I love to take the challenge of creating a viable story in a reduced number of words for flash competitions.